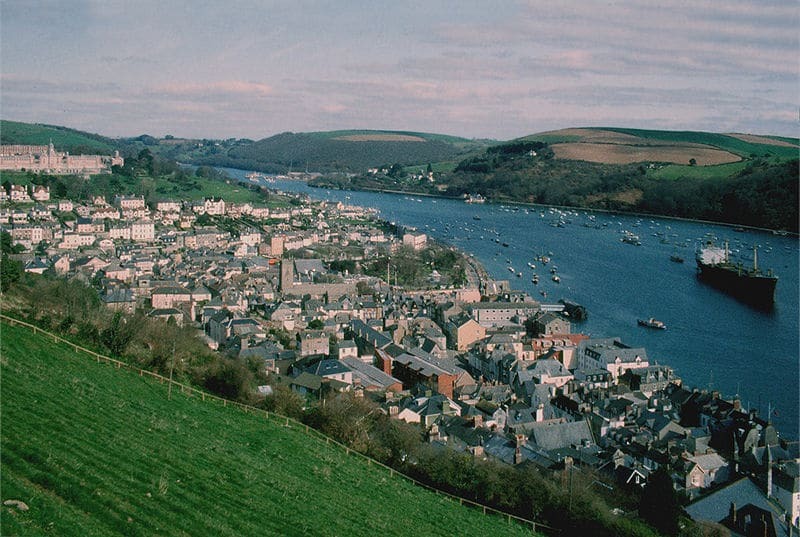 Kingswear is an attractive village overlooking the Dart Estuary, just across the river from Dartmouth. No fewer than three ferries cross the river at or near Kingswear, so it is an important location on the South West Coast Path in South Devon. In addition, the Dart Valley Trail route from Totnes passes along the estuary, with one of its seaward termini at Kingswear. There is a shorter version of the walk available. Kingswear is served by buses from Paignton and Brixham and by ferries from Dartmouth. More exotic transport access is provided by the Paignton and Kingswear Steam Railway. It should be noted that parking is very limited in Kingswear and Dartmouth. 4 stiles; one climb of 100m/330 feet and several shorter ones ranging from 25m/80 feet to 60m/200 feet. Kingswear is blessed with some superb coastal and country landscapes nearby. This walk gives a sample of some of the best of these landscapes. It crosses inland over the quiet peninsula between Kingswear and Brixham as far as the viewpoint of Scabbacombe Head, returning along the Coast Path via Froward Point. There are some wonderful views, and the walk also has its share of ups and downs, so pick a bright day, take a snack with you and take your time to savour this relatively unknown part of South Devon. The early 19th Century milestone is located next to the entrance to the car ferry. Next to it is a memorial plaque to Colonel H. Jones, who lost his life in the Falklands War in 1982. Colonel Jones will figure again later in the walk. At Kingswear Church the tower is all that remains of the original medieval church, the remainder being rebuilt in the 1840s. This rebuilding marked the change in Kingswear’s status to a separate parish; previously it had been part of Brixham parish and the church merely a chapel. There is a good view over the river to Dartmouth Castle. It was built in the late 1400s as a public defensive work, unusual when most castles were the private property of lords. It was the first to be purpose designed for defence by cannon. You will pass another memorial to Colonel Jones. Our route ahead continues along the lip of a valley leading from the coast. Looking back, there are scenic views over the sea at Mill Bay Cove. A track along the walk cuts into the surrounding landscape down to the bedrock, is an old packhorse track. It is one of a number of such green lanes in the South Hams of Devon, this network being a superb way of exploring the countryside. The 80 foot/24m Daymark was built in 1864 by the Dartmouth Harbour Commissioners as a guide to mariners to the position of the harbour entrance. The short cut reaches the Coast Path at Froward Point. Coleton Fishacre is a house built in the arts and crafts style in 1925/6 by Oswald Milne for the D’Oyly Carte family, best known for their association with Gilbert and Sullivan. It is superbly located in a valley leading to the sea and surrounded by gardens originally planted by Lady Dorothy D’Oyly Carte. Coleton Camp is a World War II establishment used as a base for coastal defence. Scabbacombe Head, and the bench is a good attractive place to stop and reflect. To the left the Devon coast curves away to Berry Head with its lighthouse. In front is the headland of Sharkham Point and nearer still the distinctive pointed shape of Crabrock Point. The path gives superb views over to Froward Point with the Mew Stone offshore and, on the skyline ahead, the Dartmouth Daymark, previously seen from inland. Along the walk you will pass the mouth of the valley in which sits Coleton Fishacre. The entrance to this National Trust house and garden was passed earlier – access is not normally permitted from the Coast Path unless you have a National Trust membership card. The superb coastal walk continues with another magically scenic section. A series of short climbs then leads to the rocky ridge of Outer Froward Point, where views open up ahead of the coast around Start Bay to Start Point in the distance, its lighthouse just visible. Nearer, the entrance to the Dart Estuary can be seen receding to the right. Until 1990 this relatively open area was an area of pine woodland. Some remnants may still be seen. The woodland was devastated by the storms which swept across South Devon in January 1990. Some re-planting is now taking place. The site of two guns was installed in 1940 to protect Dartmouth and Slapton Sands. The guns had a range of 14 miles/22 km. The miniature railway carried the shells to and from the battery. The path becomes something of a rollercoaster as it passes behind Newfoundland Cove. The name of the cove is said to derive from the local trade with Newfoundland and its fishing banks from the 1600s to the 1800s. The path through the Warren Estate is dedicated to the memory of Colonel H. Jones, whose memorials have been seen earlier in the walk. He owned this land and was tragically killed in the Falklands campaign in 1982, when he was awarded the Victoria Cross. A vantage point gives a superb view over the mouth of the estuary to Dartmouth Castle. It also allows Kingswear Castle to be seen. This smaller castle was built at about the same time as that on the Dartmouth side, around 1500. However, it became obsolete by the mid- 1600s as a result of the development of long-range guns which were installed at Dartmouth. Nevertheless, it did hold out for a while in the Civil War until captured by Fairfax for the Parliamentary army. The castellated building at the top of the beach was originally a mill, hence the name of the bay. It was later made more ornamental by the estate.